I hope you all had a safe and restful Independence Day! As I like do each year around this time, I have asked two of our newly ordained priests to share their experiences and reflections with you. 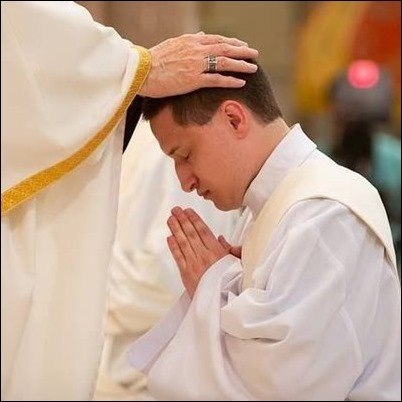 I think it’s very valuable to hear from these new priests so that people get to know them better and, hopefully, be inspired by their story of how God called has called them to their vocation. 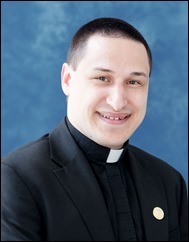 This week, we will begin with Father Michael Rora, and next week we will hear from Father Andrea Povero. May 19th I was ordained as a priest for the Archdiocese of Boston. 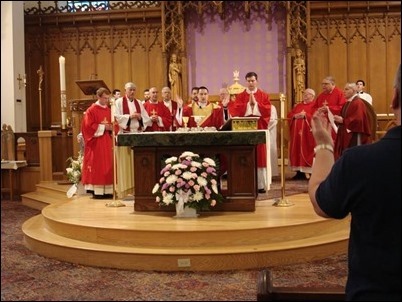 When that morning arrived I had never been happier, and since that day priestly ministry has been as much a blessing and a joy as I could have hoped for. To arrive at that moment would have been impossible without the grace of God, and he has been pouring out that grace on me my entire life. Rather than trying to recount my entire life story, I would like to simply share some of those graces and times in my life that at least in retrospect I can see the hand of God. 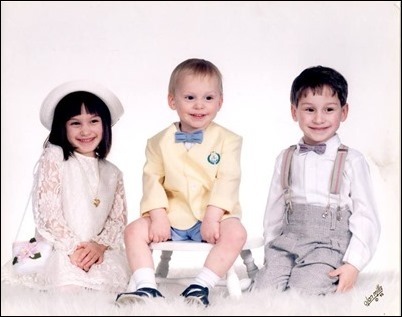 To begin, I was born on April 5, 1990 to my parents Michael and Margaret Rora along with my twin sister, Mary, and three years later we welcomed our little brother John into the family. Our parents are faithful Catholics, regular Mass attendees, active in the parish, and so we grew up with this example that being involved in the parish was important. Greatest among these — at least in my mind — was my father’s involvement in the choir. We were (and are) a singing family and so as children our first involvement in the life of our parish was singing in the children’s choir. Singing was one of the first talents I recognized that I had been given by God, that I honed, that I used, and that I turned back toward him in praise. 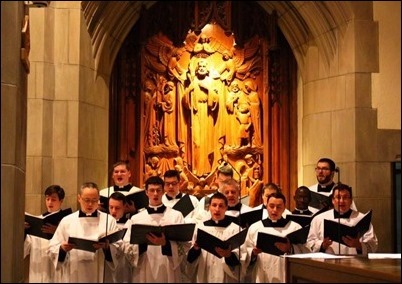 Singing was the first way I really learned how to pray, and in the choir and as a cantor from second grade onward it was almost exclusively how I participated at Mass. Still today, singing is fundamental to my faith, to my prayer, and to my celebration of the Eucharist. Of course, this led to the first real crisis in my faith, but one which now I can see was for my benefit. After my confirmation, I had been really on fire with my faith. I took that sacrament very seriously and rejoicing in that sacrament, continuing as a cantor in my parish, finishing my sophomore year of high school I thought everything was perfect until it all came crashing down. Many of us volunteer cantors were replaced by hired singers at the parish, and suddenly I felt lost. Sitting in the pews at Mass was uncomfortable; I couldn’t pray, I was angry, confused, upset, and I didn’t look forward to coming to Mass on Sundays anymore. I couldn’t sense God’s presence, I didn’t feel like he could hear me, and for about a year I was in this spiritual and emotional desolation. Fortunately, the youth group at our parish was going on a mission trip the following summer in 2007 to Peru, and my sister and I were planning on going. Fortunate, because in preparation for the mission trip we had several meetings many of which were dedicated not to logistics but to prayer. Our youth minister took the religious nature of our trip seriously and so to prepare we would pray the rosary and take some time for Eucharistic adoration. For adoration, we would have some time spent with praise and worship music playing and some time in silence. At first, it was a big help for me to have that music; once again I could feel like I was praying in a comfortable way. It was the silence, however, that was really transformative. I remember one evening while we were in adoration in that silence finally pouring myself out in prayer begging the Lord to help me, and in that silence, kneeling before the Blessed Sacrament, in an entirely new but unmistakable way I knew God was there. He was teaching me how to pray in a new and deeper way, and that struggle to be at Mass was gone. The desolation was ending, and he had greater things in store. 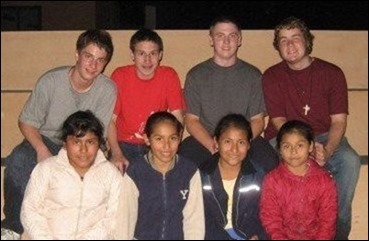 In the summer of 2007, just before our senior year of high school, my sister and I went on that mission trip to Peru with 22 others, and it was a trip filled with consolation and grace. We prayed the rosary and went to Mass daily, prayed with the families living in abject poverty in this shanty town, taught classes and played games with their children all in conjunction with a religious center set up in town. The trip was life-changing in so many ways. I was falling in love with the Blessed Mother and the Eucharist. It was easy to pray again. There were too many graces from that trip for me to adequately recount, but one in particular I would be remiss to pass over in silence. The religious brothers who were hosting us would give us periodic conferences on a number of topics, and one of those conferences was on vocations. That day Br. Carlos began his talk by telling us, “Some of you may have a vocation to the priesthood or religious life.” It was a real possibility, and it struck me as the first time I had ever been presented with the priesthood as a legitimate option. That sentence stuck with me for the rest of the trip, and as our plane took off from the airport in Lima I turned to my sister and told her I thought God might be calling me to the priesthood. We agreed to both pray about it and my formal discernment began that night. My senior year of high school, I continued to pray the rosary almost daily and I was praying to know God’s vocation for me, but I still had many ideas of my own about my future. 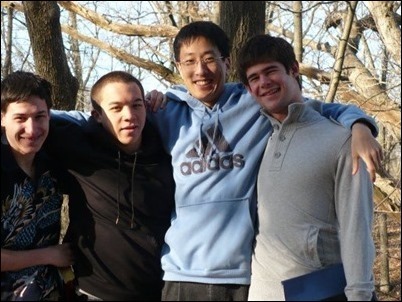 I felt that draw to the priesthood, but I had begun dating my girlfriend Kristen near the end of my junior year, and I had wanted for a long time to study biology in college. I decided I would see where that relationship went and how those studies would go and figured if God wanted me to be a priest, he would make it happen. I did my undergraduate studies at the University of Illinois at Urbana-Champaign — my mother’s alma mater — and thankfully that was exactly where God wanted me to be. There I became friends with a group of evangelical Protestants and joined their weekly Bible studies. They had so many questions about Catholicism, questions I had never had to answer before. They also knew the Scripture far better than I did, and so I began to read the Scripture avidly and consider my faith seriously. I must admit they made me far more Catholic than I ever was before, and as I read the Scripture more and more, I was acutely aware of the joy that brought me. As the years of my undergraduate progressed, it became obvious that while I really loved biology, it was talking about and studying the faith that brought me a profound joy. In my senior year, I was back to praying the rosary daily and asking the Lord specifically to show me his vocation for me and it was praying the rosary that I finally heard clearly that call to enter seminary. My time in seminary was wonderful, and it has been clear that it was the right time for me to enter when I did. 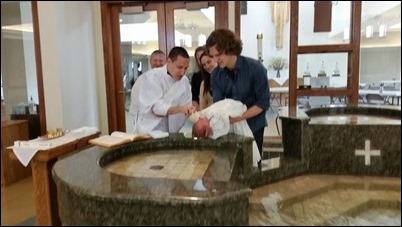 I was ordained a deacon on the anniversary of my Baptism, and in that year of diaconal ministry baptized my nephew, celebrated the funeral rites for my grandmother, sang the Easter proclamation at my parish assignment in Peabody, and preached on almost a weekly basis. As a priest, I have been assigned to a three-parish collaborative in Plymouth and Carver. This first month of ministry has been in so many ways a dream come true. The people of our collaborative have a powerful devotion to the Blessed Mother, and a fondness for adoration. They are eager to know the Scripture better, and love to sing. In other words, I feel absolutely at home. The Eucharist, the Blessed Virgin Mary, Sacred Scripture, and sacred music are the building blocks of my vocation. They are the primary avenues of grace by which God called me to an incredible vocation that I am entirely unworthy of. I am overjoyed that as a priest I can share those gifts with others so that God might use those same means to pour out his grace in the lives of others.